After a week in Italy, I left for Switzerland at 7am today, guided by my very reliable Garmin GPS fitted in my Land Rover. 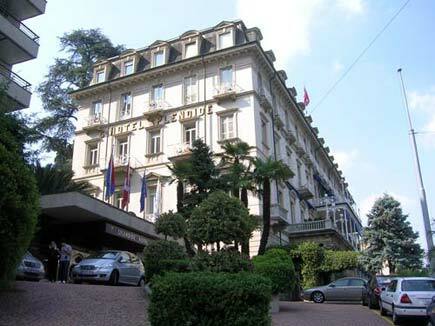 The border crossing was as quick and efficient as you can expect with the Swiss, and I drove all the way to the Splendide Royal Hotel in Lugano. Lugano is one of those unique areas in Switzerland that combines Swiss quality with Italian influences. It is famous for its lakes and mountains as well as its modern and ancient architecture. When I arrived at my hotel, I was presented a package which was left for me at the reception by the tourism board of Ticino, Switzerland. At 1pm, my host Michel Cavadini took me for a walk to the city centre and, over a delicious lunch, briefed me about the area. We also talked about how we could work together, and I presented him with copies of From Dilmun to Dublin (based on my previous tour in 2004) and the Visitor's Complete Guide to Bahrain. Later that day, I went for a walk and took some pictures, then returned to the hotel to complete some work before dinner. Tomorrow will be a busy day, with the tourism board arranging for a tour guide to show me around.